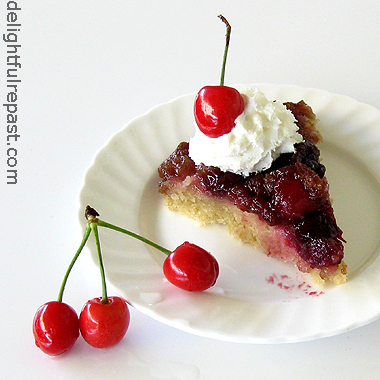 Cherry upside-down cake made with fresh sweet cherries and homemade batter is nothing like that ooey-gooey cake that was popular when I was a child. I think it was called Dump Cake. We never made it at our house, but it seemed to turn up everywhere for a time. I think you dumped a can of crushed pineapple in heavy syrup in a baking dish, then a can of cherry pie filling, then a box of yellow cake mix, then a couple sticks of margarine, sliced up. Then after it was baked and cooled, you dumped on some of that popular faux whipped cream that comes frozen in a tub. 1 Halve and pit the cherries. Preheat oven to 350 degrees. Spray the sides and bottom of an 8-inch round pan (I use a Pyrex 8-inch round baking dish) with vegetable spray, line bottom with parchment paper (not strictly necessary, but can give you "confidence"), and melt 3 tablespoons of the butter in the pan in the microwave or preheating oven. Add the brown sugar to the butter and blend. Starting at outer edge, arrange cherries, cut side up, in single layer in bottom of pan and press lightly to make them stick; set aside. 2 In large mixing bowl, combine flour, sugar, baking powder, salt and mace. Mix on low speed for one minute to blend. Add 5 tablespoons softened butter, milk and vanilla; mix on low speed for 1 1/2 minutes. Add the egg, and mix 1 1/2 minutes longer. 3 Spread the batter carefully over the cherries with a rubber spatula. Bake for about 35 to 40 minutes. Remove from oven, and let cool in pan on wire rack for 5 minutes. Loosen edges with knife, and invert onto a platter; wait about half a minute before removing pan. Peel off parchment, if used. Let cool about 45 minutes, or up to several hours, before serving slightly warm or at room temperature. 4 Whip cream and sugar to desired consistency. Garnish each serving with a dollop of whipped cream and a whole cherry. Love your upside down cake...looks delightful! Thanks, Angie! I never know what causes these computer glitches that come and go - just glad they eventually GO! Hope you can continue to leave comments and that whatever was preventing it before will not start up again. No, I'm afraid it doesn't! Go ahead and make the Dump Cake! Thank you so much, Mary. And thank you for the info about the devastation of Michigan's cherry crop. The link you sent http://www.michfb.com/agrinotes/index/294/2506 tells the sad story. Oh, I'm going to do such a good deed! And yet I tremble in fear because I am also going to incur the wrath of the food police…again. See, I am also an aficionado of cherries (especially black cherries). More than that, I am cherry omnivorous. And that's where the problem begins. Because I love(d) maraschino cherries and other candied versions – a cardinal sin. But wait! A ray of light. Because I swore off maraschinos years ago when I saw studies of benzoate of soda and similar preservatives which seem to have a deleterious effect on DNA. In consideration that there must be similar-minded folk (closet cherry omnivores) reading your blog, I will pass along this consumer info: I recently discovered a delicious brand of imported black cherries from Italy preserve with citric acid. Pricey stuff – $15 a bottle – but the stuff tastes like the old narcotic Cheracoal cough syrup that left a beautiful sweet burn and spiked the pulse. The product name is Ciliegie in Sciroppo di Amarena. Thank you, thank you…it was nothing, really. Sorry if you have to wait till next year's crop – I bought 60 bottles. Sully, *please* tell me that those cherries have not been bleached white and dyed like maraschino cherries. To me, that is worse than the horrible preservative. I'll have to look into that! No bleach & dye job on these. Heavy syrup, though. Alrighty then, they have my approval. Debra, thanks! I'd like to count the number of chemicals in Dump Cake - but I'm not sure I can count that high! I had a rather poor outcome with a pineapple upside down cake last month. But I've had such good results with your recipes, Jean, that perhaps I'll give this a try. I think I'll wait for an "occasion" though. Ruth, I'm glad to hear you're having good results with my recipes! I haven't posted my pineapple upside-down cake yet, but when I do I think you'll see it solves the usual problems with such a cake. Thanks, Tammy. I'm glad this comment came through. Yep, once you get used to homemade, the stuff from a box just won't do. I've been cutting back on the sugar and fat for years, and I can hardly eat any other way. Sadly, I swell up like a balloon when I eat cherries. Love them, hate them. Poor Mrs. Tuna! I understand. I've had some severe food allergies to things I really liked. Fortunately, food allergies are often temporary and sometimes you can eventually eat the food again without a problem. "Dump cake" - lol, sounds less than appetising! This however... yummy! I love cherry cakes Jean, although don't often use fresh cherries. Charles, thank you. Cherries are in season for such a short time, I'm glad this can be made with frozen cherries as well. Looks delicious Jean! I might just have to make this in the coming weeks. This week is my wife's birthday though and she requires a lemon cake! Tonight I'll be making your black bean soup recipe (yes, again!). Richard, thank you! 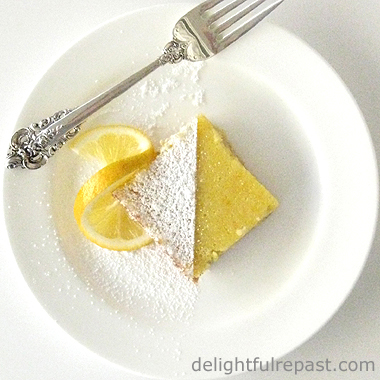 I love lemon cake too. Someday I'll post my lemon layer cake recipe. Enjoy the soup--good idea, maybe I'll make it too! I'm thrilled to see this recipe - I can't get enough cherry inspiration right now!! Thanks, Ashley! Aren't cherries wonderful! I am making this tomorrow night!!! Thank you so much Jean. Do you think it will travel well? I've got to drive it about three hrs away on Friday. Paper Clips make great cherry pitters. Simply bend the center portion straight out and insert it into the cherry. Twist half way and pull. Thanks for the tip! I'll have to give that method a try, in case I misplace my Oxo or am called upon to do something with cherries in a friend's kitchen (I end up cooking at other people's houses a lot! ).